Like other works of Renoir's early maturity, Bal du moulin de la Galette is a typically Impressionist snapshot of real life. It shows a richness of form, a fluidity of brush stroke, and a flickering, sun-dappled light. From 1879 to 1894 the painting was in the collection of the French painter Gustave Caillebotte; when he died it became the property of the French Republic as payment for death duties. From 1896 to 1929 the painting hung in the Musée du Luxembourg in Paris. From 1929 it hung in the Musée du Louvre until it was transferred to the Musée d'Orsay in 1986. Renoir painted a smaller version of the picture (78 × 114 cm) with the same title. The painting is now believed to be in a private collection in Switzerland. Apart from their size, the two paintings are virtually identical, although the smaller is painted in a more fluid manner than the d'Orsay version. One is presumably a copy of the original, but it is not known which is the original. It is not even known which was the one first exhibited at the 3rd Impressionist exhibition of 1877, because although the painting was catalogued and given favourable attention by critics, its entry did not indicate the size of the painting, information that would serve to identify it. For many years it was owned by John Hay Whitney. On May 17, 1990, his widow sold the painting for US$78 million at Sotheby's in New York City to Ryoei Saito (Saitō Ryōei), the honorary chairman of Daishowa Paper Manufacturing Company, Japan. At the time of sale, it was one of the top two most expensive artworks ever sold, together with van Gogh's Portrait of Dr. Gachet, which was also purchased by Saito. Saito caused international outrage when he suggested in 1991 that he intended to cremate both paintings with him when he died. However, when Saito and his companies ran into severe financial difficulties, bankers who held the painting as collateral for loans arranged a confidential sale through Sotheby's to an undisclosed buyer. Although not known for certain, the painting is believed to be in the hands of a Swiss collector. As of January 2013[update] the Bal du moulin de la Galette is sixth (when adjusted for the consumer price index) on the list of most expensive paintings ever sold. 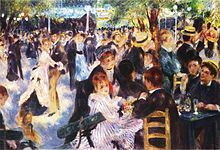 Renoir conceived his project of painting the dancing at Le Moulin de la Galette in May 1876 and its execution is described in full by his civil servant friend Georges Rivière in his memoir Renoir et ses amis. In the first place, Renoir needed to set up a studio near the mill. A suitable studio was found at an abandoned cottage in the rue Cortot with a garden described by Rivière as a "beautiful abandoned park". 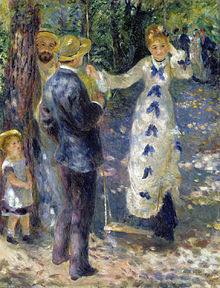 :130 Several of Renoir's major works were painted in this garden at this time, including La balançoire (The Swing). The gardens and its buildings have been preserved as the Musée de Montmartre. Rivière describes the painting as executed on the spot and that not without difficulty as the wind constantly threatened to blow the canvas away. This has led some critics to speculate that it was the larger d'Orsay painting that was painted here, as the smaller would have been easier to control. On the other hand, the smaller is much the more spontaneous and freely worked of the two, characteristic of en plein air work. ^ a b c d Rivière, Georges (1921). Renoir et Ses Amis. H. Floury. ^ a b c Sotheby's sale catalogue, New York, 17 May 1990. ^ Kleiner, Carolyn. "Van Gogh's vanishing act." "Mysteries of History". US News & World Report. 24 July 2000. Web. Retrieved 26 March 2012.